You've been selected to join an elite group of tech testers for a sneak preview at the Cleveland Museum Art. We need you — the early adopters, the technically adventurous, and the social media savvy — to join us on December 19, 5:30-8:30 p.m. for a behind-the-scenes event, the CMA Crash Party for Gallery One! Bring your iPad (or use one of ours) and help us try to crash our series of interactive displays. You may be participating in the most advanced digital gallery display in the U.S., which showcases interpretation, design, and new technologies in collaboration. While you're testing, our team will give a short presentation to demonstrate and discuss the process behind the build. We hope you'll share any insights you have with us. We promise — you'll be engaged with art in a whole new way! This event is by invitation only. Please RSVP for Security Clearance. Cleveland Events - our city leading the nation! Provides interactive map and customizable tours. Identifies art with iPad camera, then provides art history and displays informational videos. I highly recommend that you visit the museum when Gallery One opens in the new year. The ArtLens iPad app, which will work through the entire museum, will be available in the Apple App Store in January 2013. The first thing I did at the Crash Party was to have a short "how to use the ArtLens app" training. 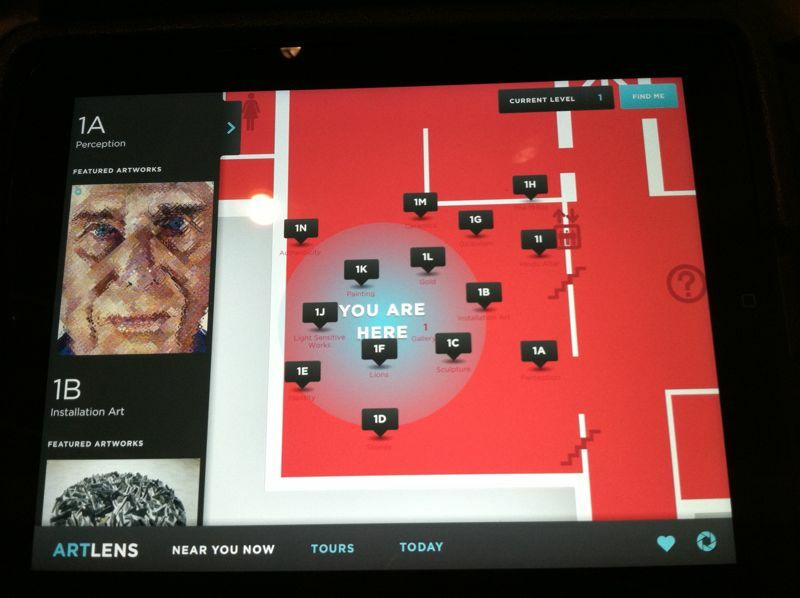 Starting with the map feature, I learned that the map used the museum's WiFi system to show what room you were in and the collections of art in that room. 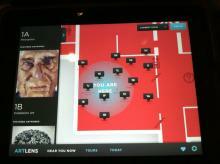 With the app, you can use tours of the museum created by others or you can create your own tour. The Crash Party attendees only tested the app in the Gallery One area, but the ArtLens app will work throughout the museum. There is more the ArtLens app can do. Please feel free to share what you learn by adding a comment below after going to the art museum and giving it a try. A HUGE art wall is a major feature of the new Gallery One. The wall lets you interact with the large collection of the museum and also mark pieces as favorites by dragging them to your iPad ArtLens app. Once marked in the app as a favorite, you can share them via Facebook and Twitter, and create your own tour. Here is an official Art Museum video, followed by some videos I took at the Crash Party. There were also several interactive displays in the new Gallery One. Here are some examples of the displays. Draw a line: Lets you draw lines on the screen and see artwork that contains those lines. History information: interact with photos that provide more information about artwork near you. Be sure to take a look at these tweets. Many have great photos and comments that will give you insight into what Gallery One and the ArtLens app will offer when it opens to the public in the new year. Looks like the @clevelandart Museum has migrated its website successfully to Drupal. Congrats to the CMA web team! can't wait for tonight's #CMACrashParty. Hope all the iPad tech that CMA has been teasing is as amazing as its promise. Transforming the art museum experience: Gallery One.Go to clevelandart.org/galleryone for more information. @rockmysole just broke the display at #CMACrashPartyNow he owns it.
.@sandon53 follow #GalleryOne to learn more about this @clevelandart new app!! @rock_my_soles #galleryone think I broke the face recognition thingie..
ha! RT @rock_my_soles: @rock_my_soles #galleryone think I broke the face recognition thingie.. Heading home. Had such good time at #GalleryOne did not realize it was almost tomorrow. As a person who has been visiting the Cleveland Museum of Art since taking Saturday classes in high school, I really appreciate all the new developments at the museum (see here the panoramic photos I took during the Chalk Festival). Congratulations to Jane Alexander (@JanecAlexander) and her team at the Cleveland Museum of Art for creating this world class resource for Cleveland. I look forward to returning to the museum to learn more. The ArtLens iPad app can now be installed at the iTunes Store! Please click here. United States, blends art, technology and interpretation"
We are very fortunate in Cleveland to have the Cleveland Museum of Art (@ClevelandArt). I remember enjoying attending art classes there while in high school, and my wife and I have always enjoyed visiting. With my interest in the museum and in technology, it is with great civic pride that I share the following about our art museum being the first in the nation to feature interactive technology. In addition to the big opening on January 21st, please be aware of these special, free Cleveland tech meetings related to new technology at the museum. These meetings are being held by the Greater Cleveland PC Users Group (@GCPCUG), and the Cleveland Drupal Users Group (@DrupalCleveland). We are lucky to have so many free and low-cost tech education meetings like these. Please remember to check back with sosAssociates.com each week and follow sos_jr on Twitter to learn more and share with others.